Just wanted to let everyone know that while we're trying to make sure all former DiveOnIt Scuba Supply (DiveOnIt, Inc) customers are well taken care of, we may not be able to handle every situation. ScubaTrainors, LLC did NOT purchase the original business "DiveOnIt, Inc" nor the sole-proprietorship DiveOnIt Scuba Supply that existed after the revocation of DiveOnIt, Inc's corporate status in 2014. We entered into an agreement with the landlord to take over the retail space, then purchased select fixtures & assets from the former owners of the shop. 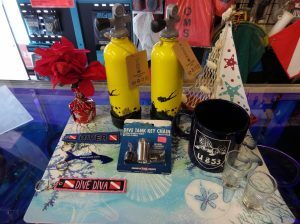 We chose to keep the name "Dive On It Scuba" to allow customers to find us easily and know that some of the former instructors were now operating the shop. We also became custodian of records for PADI divers certified thru DiveOnIt, Inc & DiveOnIt Scuba Supply (for the records on-hand and available at the 1000 Mendon Road location). If you have a prepaid class, equipment owed or gift card issues by DiveOnIt INC/DiveOnIt Scuba Supply prior to March 2017 please contact us at the shop to see how we may be able to help. If you have left equipment or tanks to be serviced prior to March 2017 we may have it on hand. However, some items such as cylinders or regulators may have been out for service at other locations. We're still trying to track down what's going on with those items. If you have an air card purchased prior to March 2017, we will honor one card (9 fills maximum) per customer until June 30th 2017. Any further questions, don't hesitate to contact us.